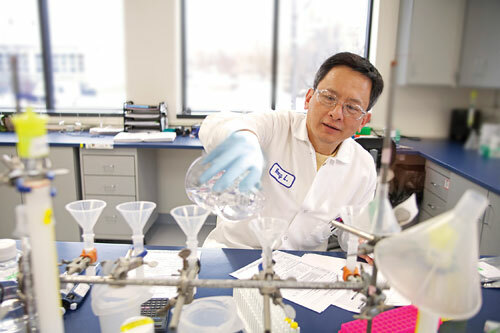 With a new name and a new CEO, Bio-Techne has begun an aggressive growth strategy to ensure that researchers know not only its flagship brand, R&D Systems, but the company as a whole. One year ago, when Chuck Kummeth joined the company as CEO (coming from Thermo Fisher Scientific), “Researchers knew us as R&D Systems. Techne was a holding company and the trading entity on the NASDAQ. Its name wasn’t used for commercial purposes,” he says. That situation wasn’t conducive to growth, so a new strategy was devised. The company was restructured and, in April, renamed Bio-Techne. This brings all its brands—Boston Biochem, Tocris Bioscience, BiosPacific, Bionostics, and R&D Systems Hematology—into one portfolio. Newly configured, Bio-Techne encompasses several well-known brands that have been channeled into company divisions. These brands include R&D Systems, Tocris Bioscience, and Boston Biochem (Life Sciences); R&D Systems Hematology and Bionostics (Clinical Controls); and BiosPacific (Diagnostics). That same month, Bio-Techne also announced the pending acquisition of two companies, signaling the start of an aggressive expansion program. Shanghai PrimeGene Bio-Tech, known as PrimeGene, is one of those companies. PrimeGene is a market leader in China, developing and manufacturing recombinant proteins for research and diagnostics applications. The pending PrimeGene acquisition, expected to be complete by the end of the year, is particularly strategic. As the companies have complementary products and share many customers, the acquisition will enhance value to its customers while expanding Bio-Techne’s access to the China market. The acquisition also is a key element of Bio-Techne’s global product stratification plan that will support Bio-Techne’s two main categories of users. As Kummeth elaborates, “R&D Systems is the primary brand for scientists in biopharma and academia. We have the highest purity, bioactivity, and quality in the industry and, hence, the highest prices.” Yet, many researchers, particularly in academia, are facing funding pressures that force them to choose between high quality and low prices. Often, price wins. “Many of our commodity products will be rebranded as PrimeGene,” adds Kummeth. For these products, limited performance specifications will be provided, allowing for lower price offerings. Meanwhile, R&D Systems will continue to focus on making products with higher purity and bioactivity. Kummeth asserts there are no plans to shift R&D Systems’ manufacturing to China. In April, Techne announced a $10 million equity investment in biochemical-test maker CyVek. Techne, which also committed to buying the company provided certain sales milestones are met, expects CyVek’s CyPlex™ immunoassay technology to enhance Bio-Techne’s platform. CyPlex is “a new instrument we can use to leverage our reagents and assays for next-generation ELISA-like assays,” Kummeth reveals. “We will continue to provide a variety of multiplex solutions to our customers, from screening arrays to Luminex-technology-based products to high-performance quantitative multiplex solutions via the CyVek technology.” The objective is to provide choice as customer needs change during the experimental process. CyPlex immunoassay technology combines a microfluidic cartridge with a state-of-the-art analyzer to create an efficient, automated benchtop immunoassay system that works with small sample volumes and circumvents some of the limitations of traditional multiplex systems. It provides “sample-to-answer” results in a sealed, disposable device. CyPlex will focus, at least initially, on translational research. That and other intuitive leaps have emerged from Bio-Techne’s in-house scientific insights and close relationships with leading scientists. “We get involved and enable their research,” Kummeth maintains, providing technical expertise and assays to help scientists produce the best possible outcomes. The company’s products have appeared in some 330,000 scientific journal citations. Historically, Bio-Techne’s relationships with more than 40 key opinion leaders have been informal, consisting of visits and ad hoc discussions with Bio-Techne staff, board members, and scientific advisors. Now the company is beginning to formalize those scientific relationships to maximize value to the company and to clarify the levels of support key scientists can expect as Bio-Techne continues to grow. Focus: Bio-Techne specializes in biotechnical products and clinical calibrators and controls. It develops and manufactures cytokines and immunoassays as well as antibodies, flow cytometry products, multiplex assays, biologically active compounds, and stem cell products and kits.